But an evil presence in his town targets the people Devon loves, he has to put his personal worries aside and face danger down again. Will he be able to protect his town, and if he can, will Wade be waiting for him when it’s done? “Eagle in the Hawthorn” marks the beginning of the end, it’s the first book of the last trilogy in the Rowan Harbor Cycle. Once again, this is not a standalone. You have to read this series in order or you’ll be lost. We’re back with Devon and Wade, my least favourite couple of the three. It was still kind of sad to know this would be their last book, though. This book made me like Devon a little more. I like how completely unromantic he is. I’m not much of a romantic myself, so I can totally relate to that. His reaction to Wade’s disappointment was still annoying, though. I get that the unromantic proposal wasn’t very well thought out, but even the most unromantic person in the entire world should be able to understand their partner. It made me want to shake him a little. There was a lot of family drama going on, or at least there should have been. It all felt a little flat and got an awfully convenient resolution. We get more scenes with Oak, who’s my most favourite secondary character in the series. I could totally see myself becoming friends with them, so I was really happy about their on-page time. We also get more scenes with all the friends and it was nice to catch up with everybody. The big bad villain makes an appearance and we learn a few things about what’s really going on. The final showdown was very anti-climactic, however. Suddenly, the threat didn’t seem all that dangerous anymore and was beaten in record time. So, yeah, me and Devon and Wade just aren’t really clicking. But that’s okay, I’m really looking forward to the final two books. Every series has its weakness and to me, that’s Devon and Wade in Rowan Harbor. I’m not a huge fan of the cover. The model looks a bit like a Ken doll and not like a real human. Especially his hair. This entry was posted in Book Reviews, Books, eBooks, Fantasy, LGBTQ Book Reviews, M/M Book Reviews, M/M Fiction, M/M Paranormal Fiction, M/M Romance, Uncategorized and tagged A Free Dreamer Review: Eagle In The Hawthorn (Rowan Harbor Cycle #7) by Sam Burns, author Sam Burns, Eagle In The Hawthorn (Rowan Harbor Cycle #7) by Sam Burns, The Rowan Harbor Cycle Series by Sam Burns. 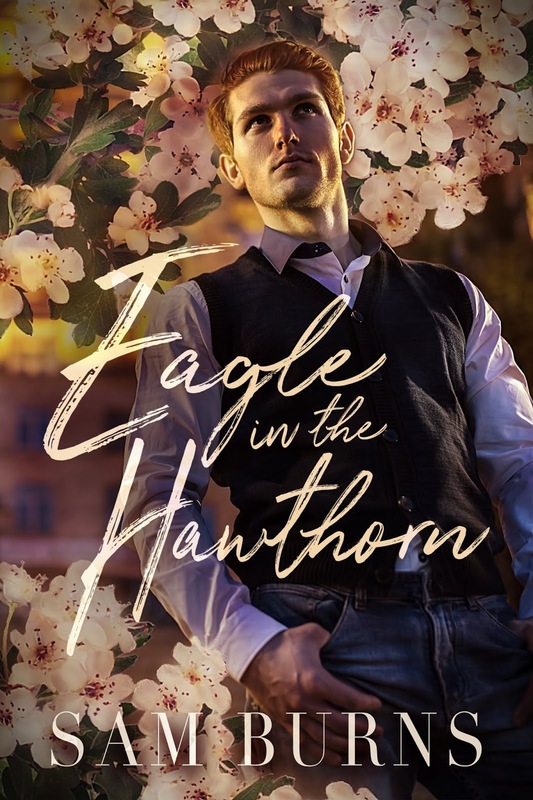 This entry was posted in Book Giveaways, Book Reviews, Book Tours and Contests, Books, eBooks, Fantasy, LGBTQ Book Reviews, M/M Book Reviews, M/M Fiction, M/M Romance, Uncategorized and tagged #EagleInTheHawthorn #newbookreleaseblitz #giveaway, @SamBurnsWrites, Signal Boost Promotions, The Rowan Harbor Cycle Series by Sam Burns. In case you’re wondering, no, “Adder and Willow” is not a standalone. You have to start with book one to fully understand and enjoy all the other books in the series. So far, Sean and Jesse were my favourite couple of the series. But after this book, Fletcher and Conner are definitely giving them a run for their money. They’re so wonderful together and I really love their dynamic. And Fletecher’s fox form is so adorable. Their first book ended with them just starting to date and “Adder and Willow” starts with them as an established couple of a few months. I can see how some people might be disappointed by that but personally, I really like established couples. And there’s still a lot of serious relationship building happening. Meeting the parents is always an important turning point and there were also a few other things happening with serious impact on their relationship. We get a lot of Fantasy action this time around and I absolutely loved it. 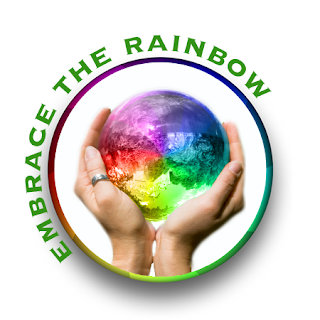 I was so hooked, I just couldn’t put the book down and finished it in two sittings. It would have been one, if I hadn’t started reading so late at night. And we get to see more of Oak, so yay! I won’t go into any more details to avoid spoilers. Just know that you’re in for one hell of a ride this time around. There’s quite a bit of character development happening as well. Fletcher has some serious growing and changing to do and by the end, he’s well on the way to overcoming his troubles. Conner is such a wonderful boyfriend and together, they’re absolutely perfect. Honestly, “Adder and Willow” is easily my favourite book of the entire series so far. It felt like a whole new level of worldbuilding happened and we get a pretty detailed look into how magic works in this universe. I like how this series doesn’t just focus on the couples but also keeps showing us glimpses into the lives of the other residents. So, yeah, this was awesome. If you liked the fantasy elements in the previous books, you’ll love “Adder and Willow”. The cover by Melanie Farlow is pretty awful. It looks horribly fake and just really doesn’t fit the awesome story at all. I don’t think there are any mountains around Rowan Harbor to actually go hiking in, like the cover seems to imply. This entry was posted in 5 star Rating, Books, eBooks, Fantasy, LGBTQ Book Reviews, M/M Book Reviews, M/M Fiction, M/M Paranormal Fiction, M/M Romance, M/M Supernatural Fiction, Uncategorized and tagged A Free Dreamer Highly Recommended Novel, A Free Dreamer Review: Adder and Willow (The Rowan Harbor Cycle #6) by Sam Burns, Adder and Willow (The Rowan Harbor Cycle #6) by Sam Burns, author Sam Burns, The Rowan Harbor Cycle Series by Sam Burns. Read Scattered Thoughts and Road Words 5 stars out of 5 review here. 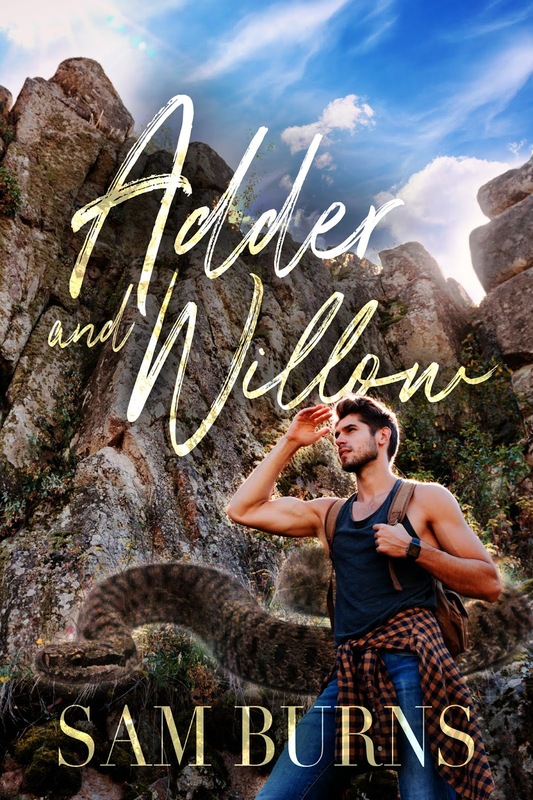 This entry was posted in Book Giveaways, Book Reviews, Book Tours and Contests, Books, eBooks, Fantasy, LGBTQ Book Reviews, M/M Book Reviews, M/M Paranormal Fiction, M/M Romance, M/M Supernatural Fiction, Uncategorized and tagged @SamBurnsWrites #newbookrelease #AdderandWillow #giveaway, Adder and Willow (The Rowan Harbor Cycle #6) by Sam Burns, author Sam Burns, Signal Boost Promotions, The Rowan Harbor Cycle Series by Sam Burns. 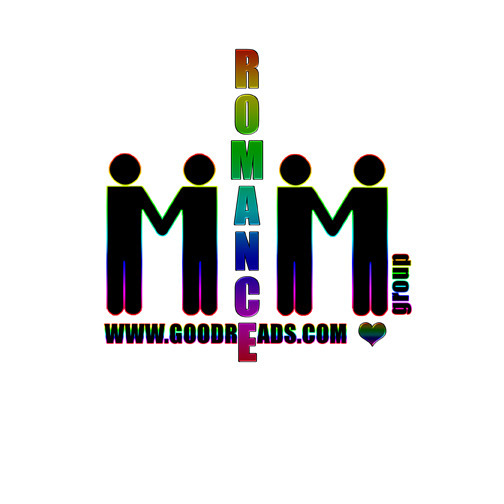 This entry was posted in Book Giveaways, Book Reviews, Book Tours and Contests, Books, eBooks, Fantasy, LGBTQ Book Reviews, M/M Book Reviews, M/M Fiction, M/M Paranormal Fiction, M/M Romance, M/M Supernatural Fiction, Uncategorized and tagged @SamBurnsWrites #newbookrelease #AdderandWillow #giveaway, Adder and Willow (The Rowan Harbor Cycle #6) by Sam Burns, author Sam Burns, Signal Boost Promotions, The Rowan Harbor Cycle Series by Sam Burns. In “Stag and Ash” we’re back to my favourite couple of the series: Sean and Jesse. Once again, this book is not a stand alone. You have to read the previous books to understand enjoy this book. I really like both Jesse and Sean and their relationship dynamic. They’re so wonderful together. Neither of them is perfect and Sean is definitely going through a rough time after his mother’s death. Jesse has to face his own demons and he grows while doing so. I think I actually like him even more now than I did after their first book. We also get some more world building and learn some interesting details. I really enjoyed those parts. Overall, this book is a quick, fun read. I finished it in less than 24 hours and found myself well entertained. But just like the rest of the series, “Stag and Ash” is a bit short and was over too soon. It kind of feels like the books always finish before things can get really going. But it’s better than part four, which was my least favourite so far. I really hope the next books will be longer again. The cover by Melanie Farlow fits the overall look of the entire series. It’s not my favourite but it’s okay. This entry was posted in Book Reviews, Books, eBooks, Fantasy, LGBTQ Book Reviews, M/M Book Reviews, M/M Fiction, M/M Paranormal Fiction, M/M Romance, Uncategorized and tagged A Free Dreamer Recommended story and series, A Free Dreamer Review: Stag and The Ash (Rowan Harbor Cycle #5) by Sam Burns, author Sam Burns, Stag and The Ash (Rowan Harbor Cycle #5) by Sam Burns, The Rowan Harbor Cycle Series by Sam Burns. You can find Scattered Thoughts and Rogue Word’s review here. We definitely recommend it. 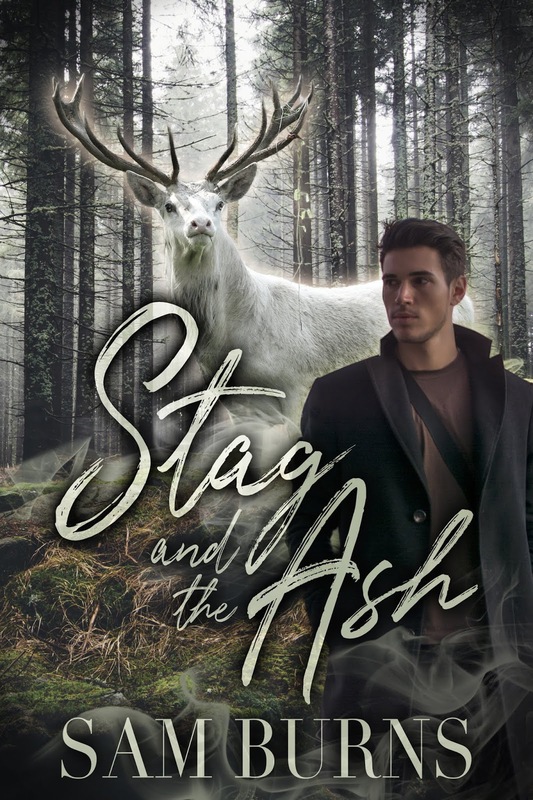 This entry was posted in Book Giveaways, Book Reviews, Book Tours and Contests, Books, eBooks, Fantasy, LGBTQ Book Reviews, M/M Book Reviews, M/M Fiction, M/M Paranormal Fiction, M/M Romance, Uncategorized and tagged @SamBurnsWrites #newbookrelease #StagandtheAsh #giveaway, author Sam Burns, Signal Boost Promotions, Stag and the Ash (Rowan Harbor Cycle #4) by Sam Burns, The Rowan Harbor Cycle Series by Sam Burns. Devon and Wade from book one are back in this fourth installation of the series. They’re my least favourite couple of the three. Devon is just too genuinely nice. While we do find out a little more about his heritage and how that influences his character, I still just can’t quite bring myself to like him. “Hawk in the Rowan” mostly focuses on Devon and Wade and their relationship woes. There’s also a storm and some other ominous things happening around town. But overall, it definitely showed that this is the shortest book of the series so far. It felt like we were only just getting started on the real plot at the end. It just wasn’t quite satisfactory and felt more like a little short story between two “real” books. A shame, because I think even Devon and Wade have great potential that just got lost due to not enough pages. Cover Design: Melanie Harlow @ Clause & Effect. The is beautiful. I really like it and it fits the story perfectly. This entry was posted in Book Reviews, Books, eBooks, Fantasy, LGBTQ Book Reviews, M/M Book Reviews, M/M Fiction, M/M Paranormal Fiction, M/M Romance, M/M Supernatural Fiction, Shifters, Weres, Uncategorized and tagged A Free Dreamer Review: Hawk In The Rowan (The Rowan Harbor Cycle #4) by Sam Burns, author Sam Burns, Hawk In The Rowan (The Rowan Harbor Cycle #4) by Sam Burns, The Rowan Harbor Cycle Series by Sam Burns. First of all, “Fox and Birch” is not a standalone story. While we meet the third (and final) couple in this book, the events in the previous books are too important for the overall story arc to just skip over and still understand what’s going on in book three. I liked Fletcher. He’s very different from our other MCs, much more vulnerable but also so very strong. We don’t learn much about Conner, his love interest. But that’s okay, it’s their first book and I’m sure we’ll find out more about him as the story continues. However, since we really don’t know much of anything about one of our MCs, the romantic feelings were a little hard to follow. They barely know each other and Fletcher has every reason to distrust and even hate Conner. Conner coming across as a genuinely nice guy just wasn’t enough for me to understand Fletcher’s feelings. Even though there’s no magic zap like the werewolves of Rowan Harbor get when they meet their fated mates, this smacked awfully of insta-love, something I can’t stand. Aside from the love story, I quite enjoyed this book. Fletcher’s abilities are really interesting and so very different from what we’ve seen so far. I’ve never read about a fox shifter before and I can’t wait to find out even more about him and his unusual talents. This was my second favourite book in the series so far. I liked book two a little more because there was more focus on the world building. And I think Fletcher might actually be my favourite character of them all. So I’m eager for the next book about him. The cover by Melanie Harlow is nice to look at. Maybe a little too nice, because the overall tone of the book definitely felt more sinister to me. This entry was posted in Book Reviews, Books, eBooks, Fantasy, LGBTQ Book Reviews, M/M Book Reviews, M/M Fiction, M/M Paranormal Fiction, M/M Romance, M/M Supernatural Fiction, Uncategorized and tagged A Free Dreamer Recommended story and series, A Free Dreamer Review: Fox and Birch (The Rowan Harbor Cycle #3) by Sam Burns, author Sam Burns, Fox and Birch (The Rowan Harbor Cycle #3) by Sam Burns, The Rowan Harbor Cycle Series by Sam Burns.